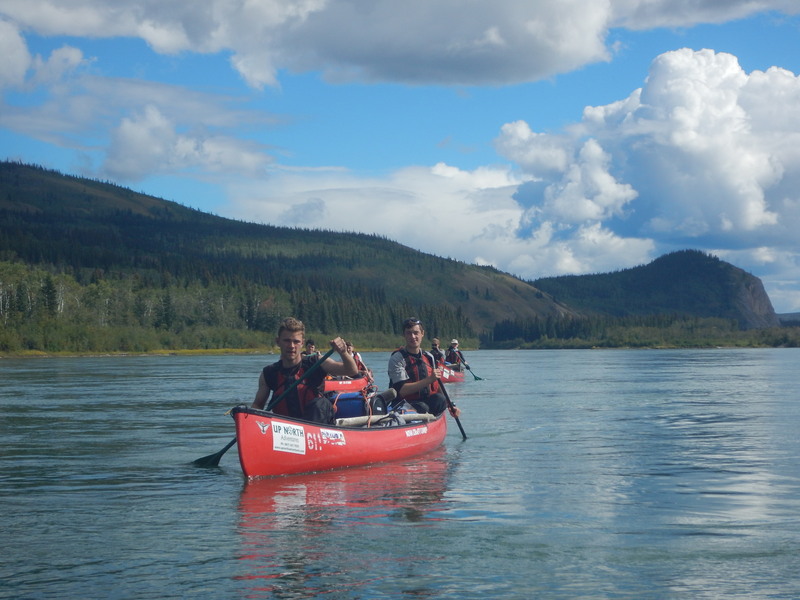 Between the 10th and 25th August 2016 eight cadets and four staff embarked on a Sussex Air Cadets led expedition deep into the Yukon Territory of Canada. 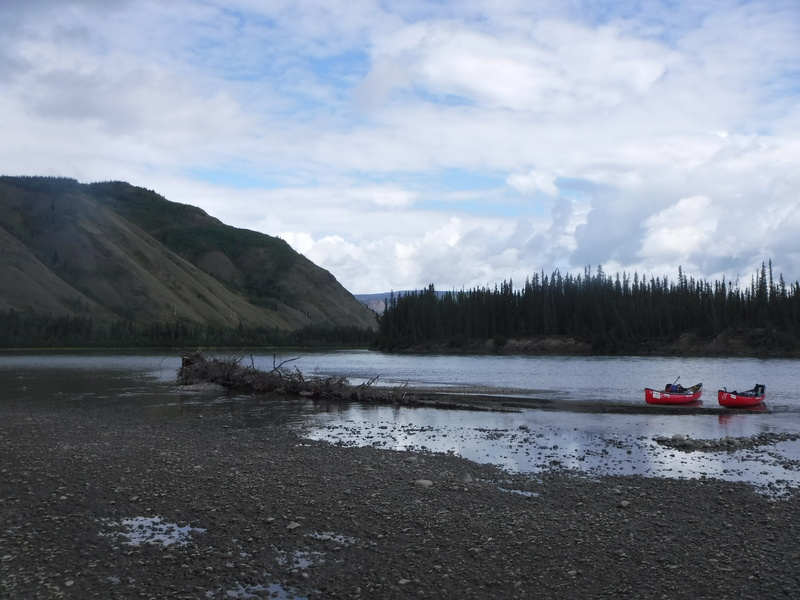 The main thrust of the trip was a 369km self-sufficient paddle in Open Canoes from the maintenance camp on Quiet Lake to a get out in Carmacks near the Arctic Circle. The trip two years in the planning, training and fundraising was only possible thanks to massive support from the Ulysses Trust, RAF Charitable Trust and Worshipful Company of Security Professionals, who not only assisted in subsidising the trip but also enabling the purchase of specialist clothing and equipment to make the trip as safe and challenging as possible. On arrival in Vancouver the group did the 2hr transfer to Whitehorse to leave themselves an afternoon to do all of the preparation for the trip, kitting out the canoes, shopping for ten days, packing all the food into bear-proof barrels, clothing and supplies into drybags. 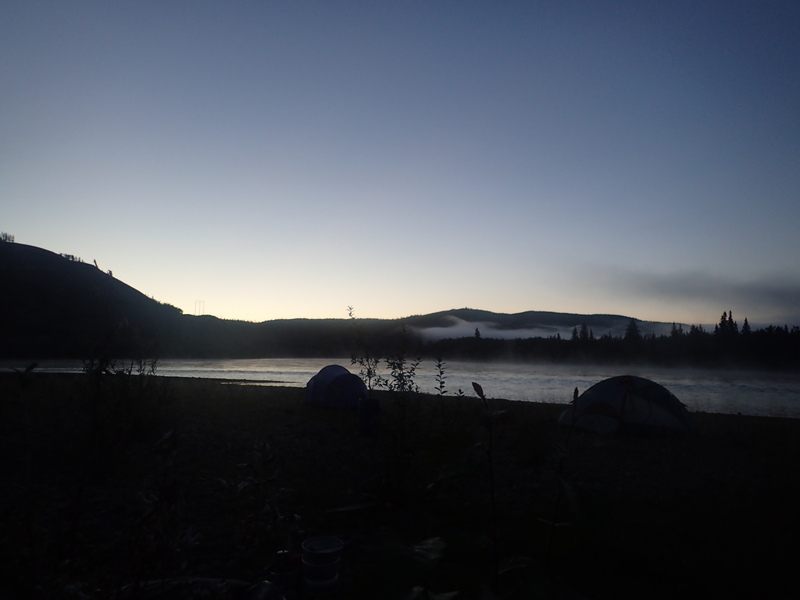 The following morning we were collected by a vehicle from Up North Adventures from whom we had hired the paddling and safety equipment and driven 4 hrs to the Maintenance Camp on the eastern bank of Quiet Lake. Suddenly as we were packing the boats the enormity of the task and the potential risks hit home, on the journey in we saw two black bears running along the side of the road and when the van drove off it was just us and our equipment for ten days. As we readied to set off there was a mixture of excitement and apprehension in the team especially with the wind picking up a little and a lake paddle not unlike Loch Ness, just bigger!! Two hours later we found a good campsite at the north shore of the lake at the entrance to Brown Creek. The first evening saw a frenzy of activity as the cadets learned very quickly how to separate the cooking and camping areas, dig a latrine and a food bin, build and light an open fire to cook on and set the camp in the spaces available between the trees. A safety brief was followed by a stunning sunset which set the standard for the trip. Day two required us to negotiate the rest of the lakes complex. Two short river phases were separated by an open water paddle across Sandy Lake where we noticed for the first time the wind we had been warned of, however by the time we reached Big Salmon Lake the wind had picked up to a force 4 with some significant swell which was on the limits for our heavily laden boats, especially as it was at 45 degrees across the lake rather than a head or tail wind. 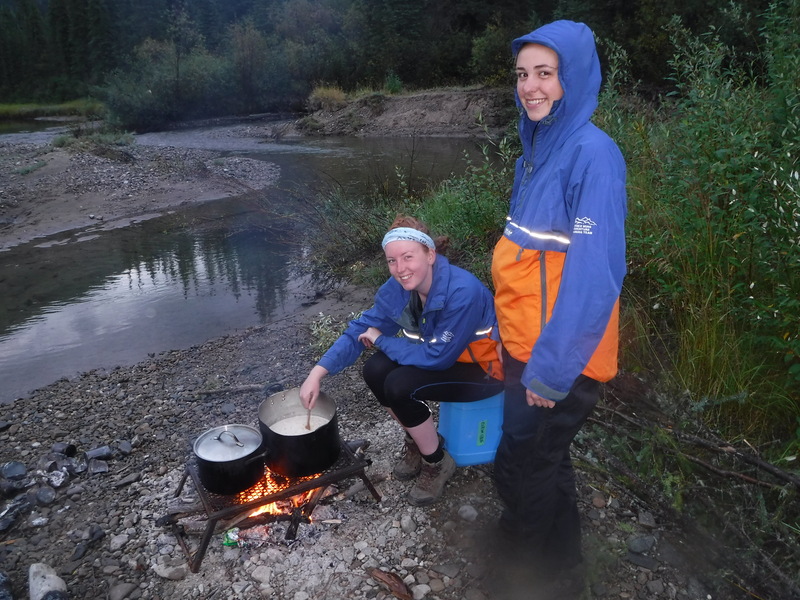 The looks of relief on the cadet’s faces when we finally made camp at the First Nations Camp at the entrance to Big Salmon River said what a challenge it had been!! That evening we saw our first signs of the famed spawning salmon, with bald eagle taking a keen interest and slightly worryingly huge fresh bear tracks near the camp!! Day 3 was our point of no return. Once down the river there was no back tracking. We were on our own for the next 8 days. We were now way beyond any outside help and we hadn’t even got to the technical stuff yet. After an hour we hit our first major log jam on a channel in the river. It was completely blocked with a dangerous line someone had attempted to cut through along one edge. It looked like a portage around 200 metres but would have taken over 2 hours had we done that option. A quick scout through the logs looked like we could line the boats through a narrow channel. We quickly got organised with a chain and using stern lines got all the boats through in forty minutes. A great team effort. This was a turning point on the trip, it showed that all the training had paid off and everyone knew what to do without being told. A big confidence boost. The river now was fast, shallow, narrow and had very tight bends with lots of tree hazards at every turn. But the group managed it comfortably and were learning with every kilometre covered. The next couple of days were amazing paddling with the river flowing nicely, great views and scenery and wildlife at every bend. By day 5 we were a little behind our plan, but still over 100 miles from the nearest road head or place of habitation. We needed to put in a big day. 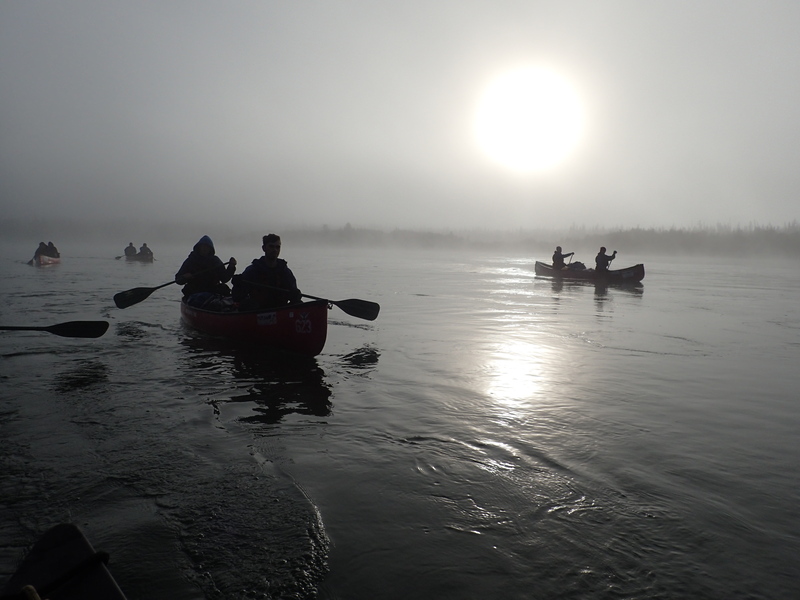 We covered 61 kilometres, a massive achievement especially as the last 10 kilometres the river slowed and meandered. We were back on track and had another amazing campsite for the night. A solid day 6 was followed by our first rain of the trip, day 7. It started overcast and the cloud eventually touched the tree tops and the rain came. Slowly at first but steady all day and into evening. Not heavy but just the type that soaks you through. This is where our sponsored Paramo outer clothing came into its own. We all stayed warm and dry and were able to continue as normal. We camped at the confluence of the North Big Salmon River a major tributary in its own right. This provided an exciting start to day 8 with a must make ferry glide across the North Big Salmon mouth. The water now increased significantly in volume and speed from this point. Two hours of fast water, tight bends and big boulders in the flow gave us an exciting ride and an exhilarating start to the day. This was definitely not the place for mistakes and our team navigated this section like seasoned paddlers. 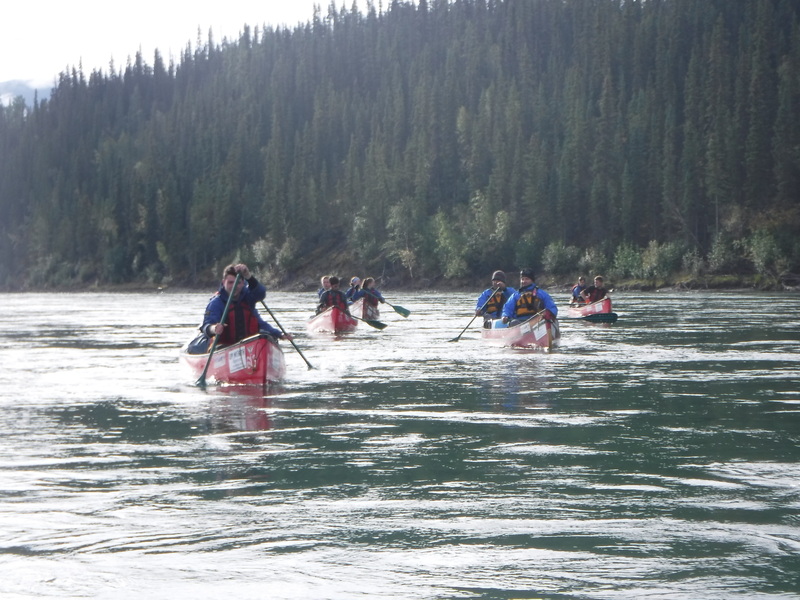 This was the day we were to join the Yukon River. Three kilometres from the confluence we met two Canadian Fisheries workers. They hadn’t seen or spoken to anyone for 3 months and were keen to talk to us. In return we learned all about how they checked and monitored the spawning Chinook Salmon. A really interesting and worthwhile break. When we hit the Yukon twenty minutes later it was a bit of an anti-climax. We were expecting our huge, fast river to push out into the main river flow with some very turbulent water to negotiate. On the contrary it was almost disappointing, wide, shallow, sandy and just melted into the main flow. We pulled in on the confluence to visit the remains of Big Salmon village another long abandoned First Nations village and Trading Post. That was 238 kilometres paddled since day one, eight days earlier. Only 114 kilometres to go to Carmacks our final destination. The Yukon was a very different proposition. It was a massive, wide conveyor belt of water moving at around 8kph. We had to change our tactics here as any decisions had to be made very early otherwise you just flew past places on the bank. 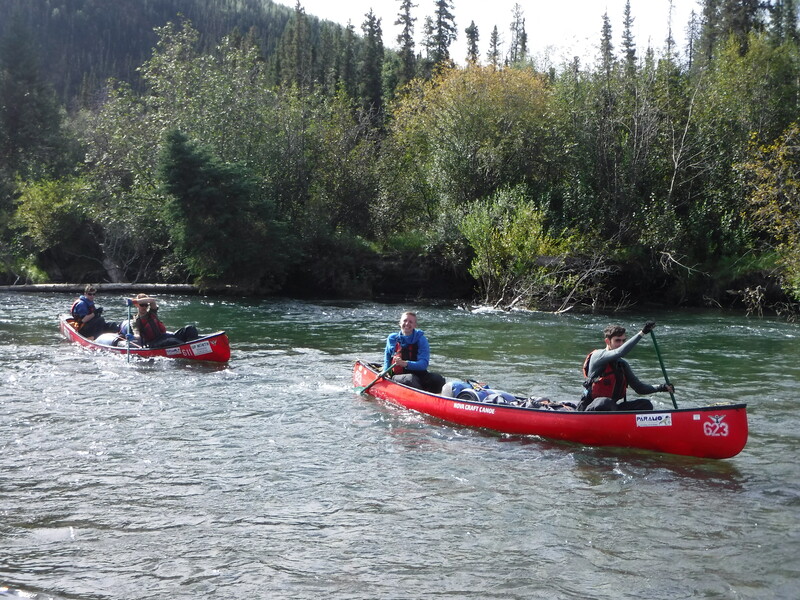 The group adapted well to the new challenge and we were soon in our first camp on the Yukon proper. We were treated to an amazing sunset that evening over the river followed by an equally amazing full moon. For most that was the best camp spot on the trip. 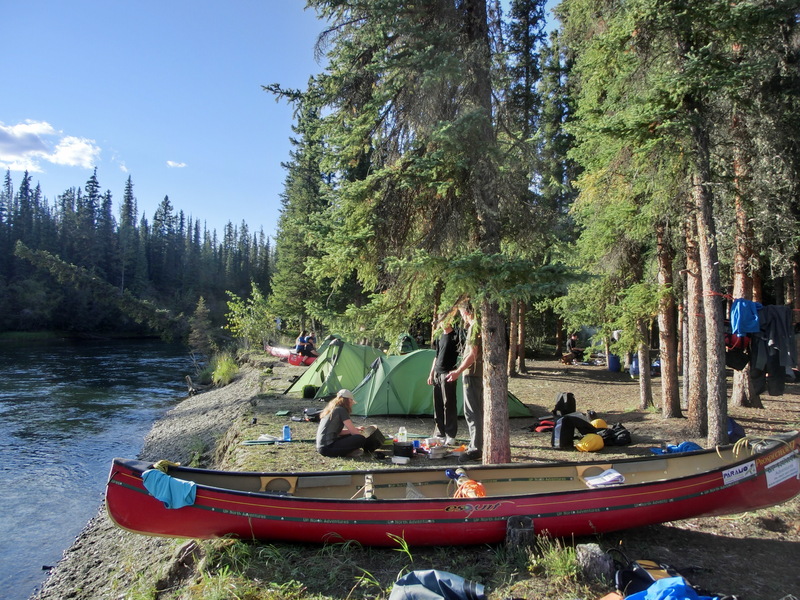 Our tents were pitched less than 2 metres from the water of one of the largest rivers in North America. It doesn’t get any better than that! Day 9 and we had to cover some ground. 68 kilometres today. A brilliant effort by the team. This put us in striking distance of Carmacks and our pick up the following day. Our final camp was on a sand bar island right in the middle of the river. It couldn’t have been a better camp to finish. It was this point where we realised that our cadet team had done 95% of the camp set up while we were still taking everything in. This was a marked contrast to night one where the staff team did 95% of the set up while the cadets wondered what was happening. That’s what these trips are all about. Taking ownership of events and working together to achieve a positive outcome. Mission accomplished. Our final day  started very early and with a cloud inversion! Visibility was still down to less than 50 metres on the water when we pushed off. The most challenging part of the trip. Navigating the multiple river channels by compass was a nerve racking task but eventually it cleared and we had some amazing photographs of the experience. Eventually signs of civilization began to show on the banks. Around our last river bend the Carmacks Road Bridge; our take out. 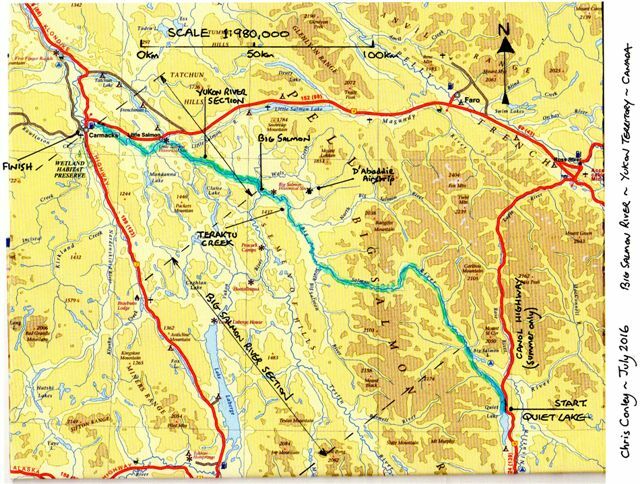 Another 114 kilometres since the Big Salmon and 369 kilometres since our put in 10 days earlier. A great achievement from all of the team. Handshakes and hugs all round while we took in what we had just achieved. The whole trip went to plan which was largely due to our preparation, training and the team spirit within our group. 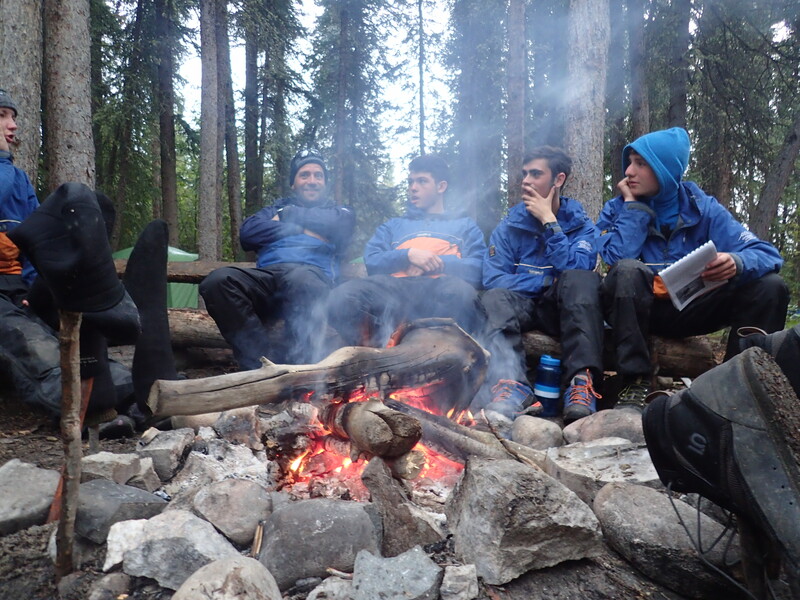 The trip proved that you can take well prepared and motivated groups into remote, hostile environments and they can take the mental, physical and technical challenges in their stride. 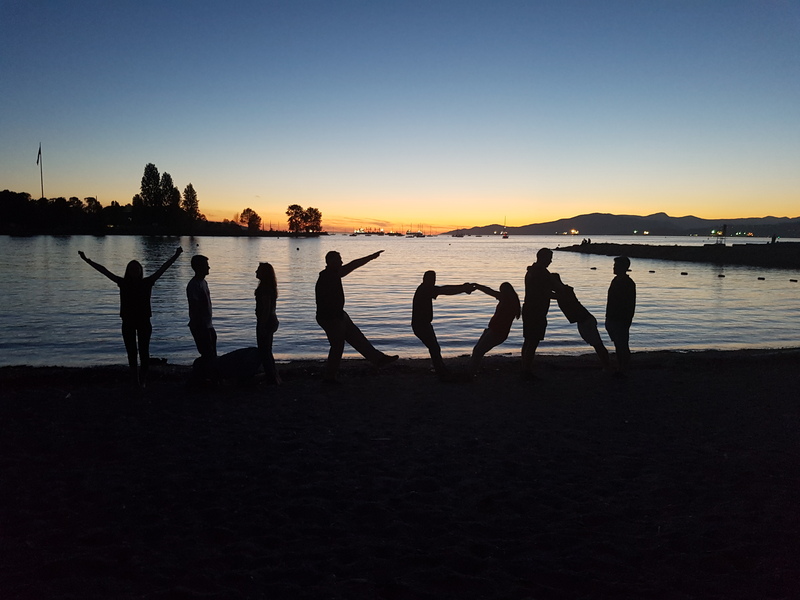 The last few days were spent on R&R in Vancouver where the team found the time to do some roller-blading in Stanley Park and an end of expedition meal. Another stunning sunset at the mouth of Vancouver Harbour really set the seal on a great trip and the silence of the group meant they were really absorbing what they had achieved.